RETRO KIMMER'S BLOG: DCAPPELLA'S JOE SANTONI TAKES OVER INSTAGRAM TOMORROW! 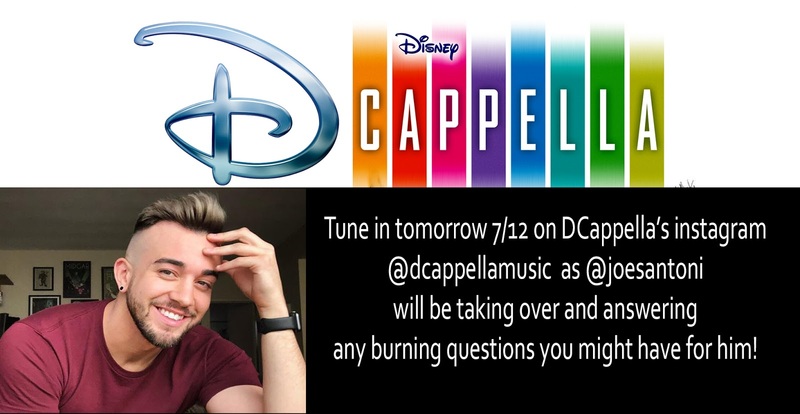 DCAPPELLA'S JOE SANTONI TAKES OVER INSTAGRAM TOMORROW! Our friend Joe Santoni is taking over DCappella's Instagram tomorrow to answer all of your questions! Let's answer the first 2 questions here! Contemporary a cappella pioneer Deke Sharon is the music arranger for the group, and brings to life modern a cappella versions of Disney hits with a fun twist. DCappella will be releasing music throughout 2018 and are set to tour nationwide in January 2019. First of all Joe is the son of my DJ buddy Chuck Santoni who I first met in the early 1980s. We both have grown up talented children now! Joe is a fantastic vocalist and Disney chose Joe to be in this fabulous group. Listen to DCappella take on the Incredibles!